The other day someone asked me what I'd do differently if I had the time here over again. We've been here nearly six years now so it's easy to look back with hindsight at the things I've done or haven't. I've learnt a lot in that time but here are three things I'd approach differently! I've always looked at this place as my "forever home" so everything I've built has been made to last. I feel this is a mistake, temporary things are really useful as well. I remember in the first few weeks of being here dad telling me to put some fire wood in an old shed that was on the drive. 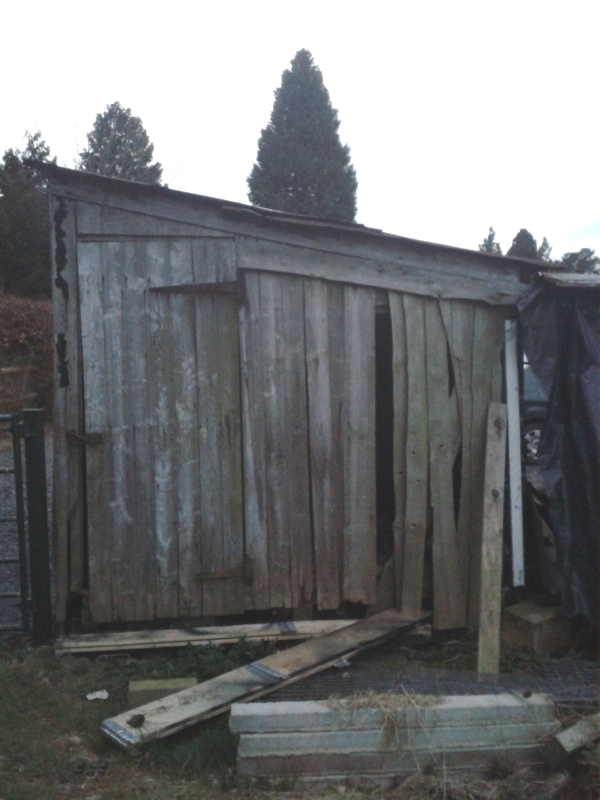 Being stubborn I said that the shed was coming down so I didn't want to use it. Well guess what! The shed is still up and it holds my fire wood each year. It's coming down one day but it's certainly slipped down my list of proprieties, in the meantime I'd rather have dry firewood and an ugly shed! The way I look at it now is that if I do a temporary job that might save me some time each day or make my life easier, even for just a few weeks, then often it's worth doing. Putting slabs down on soil might not be a very long lasting option but if it saves a month of muddy boots in the house then it's worth it. Same goes for a quick knocked up chicken run or sheep race, doesn't have to be in the right place for ever, just for when you need it. Yes I'd love a proper farm yard and sheds but until then I'm happy to make do. How I wish I'd learnt this one earlier! This is has been my biggest mistake really. The soil doesn't want to be exposed, it wants to be covered by plants, if you leave any area bare it will grow weeds. I planted up a huge garden when I got here but I left areas bare and knew I should hoe regularly to keep it clean. I underestimated how much work that would be, coupled with starting a family, working full time and working on the house things soon slipped. Now I keep my garden looking much better. I use green manures, weed membrane and quick crop rotations to make sure the veg beds are free from weeds. I'm still struggling to bring the fruit garden back under control and to be honest things have gone that far I'm considering starting again, covering it with plastic and planting a new soft fruit garden in the orchard. I took it slow getting stock on our little farm, but when I did I went quite big quite quick. The sheep were a constant source of problems for the first two years that I had them and only now in year three have things leveled out. I'm guessing that as the animals have got older and more experienced and I have as well things have just got easier. 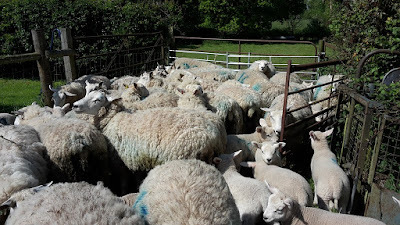 It was a new flock with it's fair share of teething problems (CODD being one I remember all to well) and then followed by a rubbish lambing it left me feeling pretty down about the whole venture. Luckily this year has been much better, lambing was actually fun (I guess not having a two month old baby helps with that one), the kids got involved and I felt prepared for it, the right equipment in the right place. Gates to make pens, harnesses when I needed (not having to run off to the store to buy them), sprays, lube, gloves, etc was all there! Read my post on lambing tips if you're doing it next year. The chickens haven't been too much trouble during this time. I've made multiple pens and tried many methods of keeping them, I really like what I'm doing at the moment and the whole pastured chickens thing would have been great to do from the start, but having the fixed pens like I did was certainly easier - especially when I had to be at work an hour away by 7.30! I've still got the coops I made and they still get used. Handy for housing sick chickens or breeding pairs, I plan to set up some different areas next year to have some for breeding. I think livestock only becomes easier over time as you gain the experience and the equipment you need. I think it would feel that you're going from 0 - 60 no matter what but I probably should have invested in some new hurdles sooner! So what were your major mistakes when you started your smallholding/homestead? What would you advice people to do differently to how you did it? Bravo for you Kev! 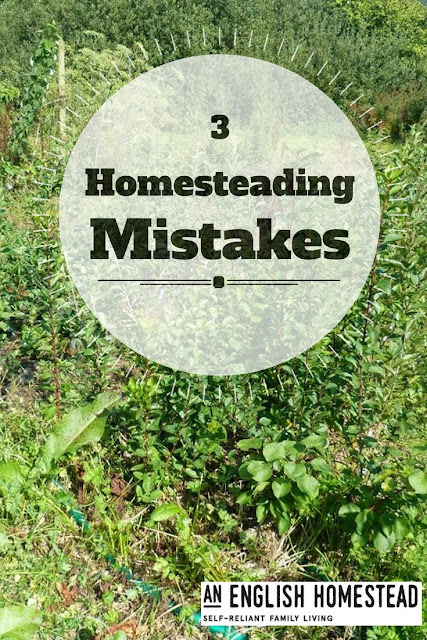 There are no failures in homesteading, just lessons to be learned. Hubbie and I have been raising livestock, growing our own food for 24 years and we are PROUD to say: we still screw up. Keep on keeping on. I've had a lifetime surrounded by it all, see other make mistakes and then quite happily make them myself as well! One day I'll get it right! My first farm had too much sloping land! Excellent advice, I can relate! I think one of the biggest things we've had to learn is that everything is a work in progress. We used to become so discouraged if an idea didn't work out or had problems. Or when something didn't last as long we we hoped before it needed maintenance and repair. When we switched our thinking to, "this is an experiment, we'll see how this goes and work from there," everything got better. We homesteaders are trying to relearn so many skills and revive a lot of nearly lost knowledge. It takes time to learn how to not react with a modern mindset but to take it all in stride and press on. I agree, a change of mindset makes everything seem better. To start with I kept thinking I didn't want to do things twice, only now do I realise that most things will need doing more than that if I live out my days here! There are very few one off tasks. Most smallholding activities, I find are recurrent but vary in frequency. Keeping on top of the weeds is relatively high frequency. So, as Leigh points out, it's all a work in progress. My biggest mistake was to think you can make a profit from a smallholding. I went into it thinking I could never make money at it. Now I've got some things in place I'm starting to think it might be possible to turn a small profit. Money or not it's a great way of life and I'm pleased I can give my children this upbringing. Mistakes we made.........not planting trees early enough to see them grow. Getting animals too soon - sheep before proper fencing was just plain stupid! Losing a good ram to flystrike because we thought someone else was keeping an eye on him where he was staying - and they weren't. I could probably think of more given time! I planted trees the first year here and I'm glad I did, since then I've planted about 500 I think and I'm sure I'll plant many more yet. Hopefully I'll see many grow! Ask my mum about a walnut tree she planted that her dad told her would never fruit while she was alive, fruits every year now! Flystrike is horrible, I truly hate it! I built on a mountainside, so I built a three story house to make maximum use of the space we cut in the mountainside. Now I wish to God I'd just built a one story house. The stairs are harder at 65 than at 32. I only built one way up the mountain, and intentionally made it a very narrow jeep trail. That has caused me trouble from time to time, like when the wood stove caught on fire and the firemen had to carry their gear up here because their truck couldn't climb the mountain. To spare the forest, which was old growth, I only cleared a space around 180 of the house, and that was to have a meadow. But with the forest fires, I run the risk of a fire coming right up on the house because the trees come right to the buildings on the other 180 degrees. Finally, I put shake roofs on all my buildings. Now they are going to have to be replaced by metal roofs. Also, the insurance company charged me a lot more for insurance because shakes "breach." There's a lot of other stuff but I don't want to leave a "too long" comment. Thanks Harry, It's good to read. Infrastructure is such a pain to plan as you don't know what will change in the future. I keep coming up with new ideas all the time and I've just spent a day on my dads farm (helping with his old roof) and that place is completly differetn to where I grew up. Where we used to keep sheep in the winter he now has four mechanics working full time! Building maintenance is something I've tried to keep to a minimum, Even my garden shed has clay tiles on! I assumed you'd have it quite clear around the house in respect to trees so you'd have a good field of vision around where you live.